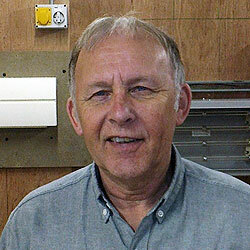 Skillfoundry was started by Nick Turner to develop video based learning resources for Electrotechnology. Many of the ideas and concepts in electrical science and technology cannot be seen directly or are quite abstract. Clear animated graphics and videos can really help with understanding the principles. Skillfoundry aims to deliver that. After completing a science degree, I had a career in the television industry as a cameraman and sound recordist. On location you are always having to work out how many lights you can safely use on each circuit, how many circuits there are available etc. That need to understand some basic principles of electrical installations lead me to take my Level 2 & 3 certificates and 17th Ed. exam at Weston College. I hope the Skillfoundry videos bring together the twin tracks of my working life. 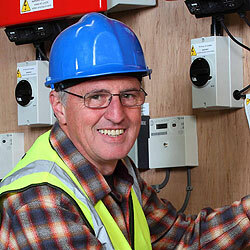 John has many years experience in the Electrical industry. After qualifying as an indentured apprentice in installation he quickly set up his own contracting business in Bristol, working for commercial, industrial and domestic clients including the National Trust. Outside of work he was developing his coaching skills as an FA coach and when a positon at Weston College was offered it was the ideal opportunity to use his electrical knowledge in a training environment. As Curriculum Manager at Weston he helped to develop the Fast Track courses for which the College was awarded the 2008 NTA National Award for Innovation – Electrical Installation.